4Easysoft Wii Video Converter, advanced Wii Converter to convert all popular videos to Wii video MOV, AVI for playback on Wii. You can convert video files, like MPG, MPEG, MPEG2, MP4, H.264, SWF, FLV, VOB, MOD, M4V, WMV, 3GP, 3GPP, MOV, and HD video(HD TS, HD MTS, HD WMV etc) for Wii. 4Easysoft Wii Video Converter provides rich output modes: split large file into smaller pieces, customize the size of video file, reset channels, adjust bitrate and frame rate, add watermark, etc. So, 4Easysoft Wii Video Converter helps you put video on Wii easily and fast. 4Easysoft Wii Video Converter provides the thorough way to convert videos to different formats completely through one time. 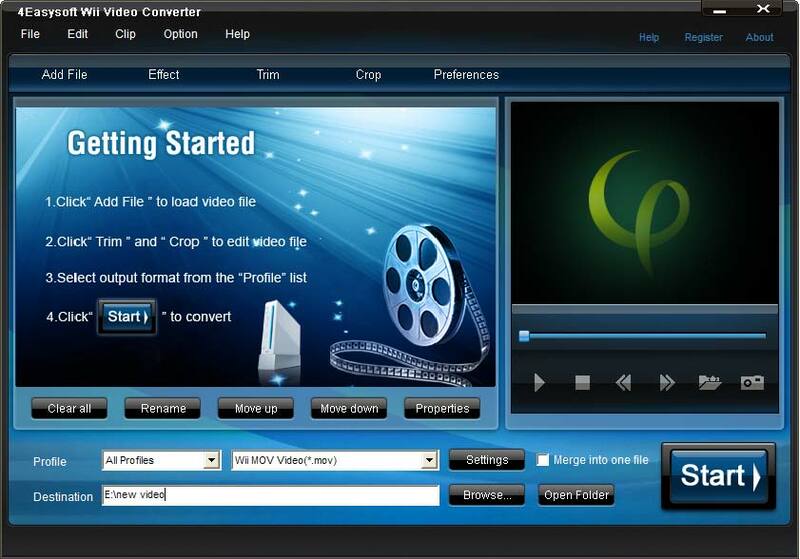 This Wii Video Converter enriches your video to Wii in the way of a wide variety of video editing functions such as video cropping, movie trimming., video merging, you even can check Deinterlacing to help you to convert interlaced video to the progressive video, this function can optimize the video effect. Watermark function allows you to insert different pictures or texts to make a new face. 4Easysoft Wii Video Converter supports selecting subtitle and audio track to make what you want effect. Having the attractive, user-friendly, and smartly organized interface, 4Easysoft Wii Video Converter brings you more convenience and enjoyment. Detecting CPU Usage automatically and supporting dual-core CPU for each task, this Wii Video Converter offers you the highest video for Wii. It supports one time converting and several or more formats files outputting. Add special watermark in the form of text or image. Choose you need subtitle and audio track.